My first ever purchase for a miniatures game was splitting a 2-player box set (of the 2nd edition 40k box, actually). They're ridiculously handy for getting you and your friend into a game. We didn't have any tape measures or dice or anything like that, but the set had everything we need. 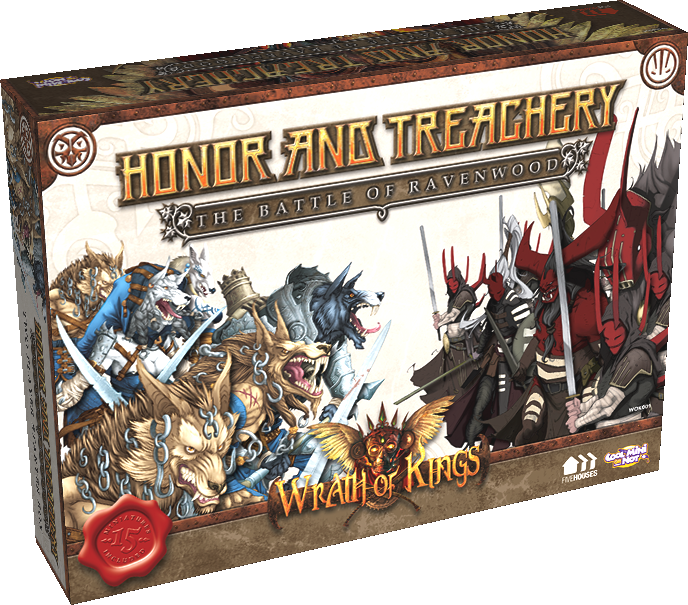 The same can be said for the new Honor and Treachery set that's been announced for Wrath of Kings. This set pits the werewolves of Goritsi versus some ashmen from Nasier. It's fang and claw versus sword to the death. The set is more than just a couple sets of minis, though, as I mentioned above. Sure, it has has figures (15 of them, to be exact, along with their requisite unit cards). But it also has a quick start rules sheet to get you going and playing. It also has dice and terrain templates in order to get you going right away, pretty much playing as soon as the glue dries on the figures. Expect to see the set on store shelves on March 12th.